Baird Rhodium Bar 5 oz - Best Prices + Free Shipping = Happy Customers! The Baird Rhodium Bar 5 oz is an excellent way to diversify your precious metal holdings and the price of rhodium today is inexpensive relative to old highs. The spot price of rhodium has exceeded $10000.00 in 2008 and today can be purchased for a fraction of that old high making rhodium an excellent value in our opinion. The main exporter of rhodium is South Africa followed by Russia. The annual world production of rhodium is only about 1/10th the amount of platinum produced. 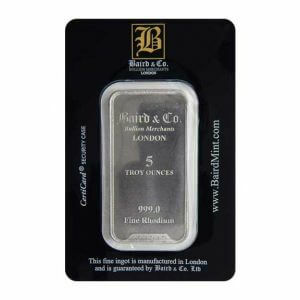 The pictured Baird Rhodium Bar 5 oz is produced in London and is guaranteed by Baird & Co., Ltd, a member of the London Bullion Markets. The bar itself is struck which produces a fine reflective surface and features raised lettering indicating the manufacturer (Baird & Co.). It also includes (Bullion Merchants) (London) – ONE OUNCE – purity and description (999.9 Fine Rhodium) and features a 6 digit incused serial number. The bar is encased in a protective plastic holder which includes the assay card and the complete package is securely sealed. The assay card features the formidable LPPM Hallmark (The London Platinum and Palladium Market) established in 1987. 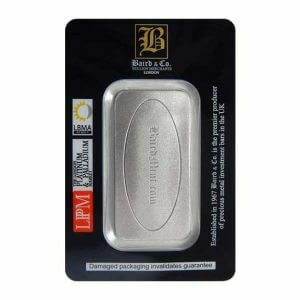 The Baird Rhodium Bar 5 oz provides a number of other advantages: (1) Baird & Co. is a world renowned refiner with impeccable manufacturing standards which guarantees this Baird Rhodium Bar 5 oz as to weight, purity and fineness. This allows precious metal dealers worldwide to post buy and sell prices which fluctuate directly with the world price of rhodium. (2) Because this bar is an accepted bullion product its premium over spot is small and attractive to bullion investors. (3) The choice of the Baird Rhodium Bar 5 oz size allows investors more options when buying or selling over larger rhodium bars. (4) Investment in rhodium is growing because the element’s major use is as a catalyst in automobile three-way catalytic converters. (5) The Baird Rhodium Bar 5 oz is not reportable on (Federal Form 1099B) when buying or selling.